A chip-free, long-lasting manicure is almost a thing of myth (unless you’re talking gels). There is one tool, however, that makes a significant difference. Turns out it’s not about the polish itself, or even the top coat, but the way you prep your nails pre-polish that is key. 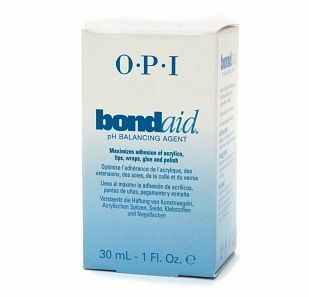 I get asked quite often how I keep my paint job looking fresh for a week and the answer is OPI’s BondAid pH Balancing Agent ($16). I ask my manicurist to apply it before the polish; the formula is the consistency of acetone, but when brushed on before a base coat it creates a very porous canvas to which the polish adheres—it’s that simple. Salons keep BondAid stocked for prepping nails before gel polish, silk wraps, or acrylics, but it can be used before regular polish, too. And while it’s primarily a professional product designed for salons, it is available in beauty supply stores and on a small selection of e-commerce sites. If you’re using it at home, paint a single coat onto clean, dry nails, let it dry for about 10 seconds, and then apply your base coat. Make sure you really like the polish color you pick, because it’ll last even longer than you think.